Man I REALLY hope I can get one of those! Makes me wanna go back and buy more alternately-sketched copies of issue 29 to have complete sketched sets...droooool... Is that possible, to have the other guys do sketches in issue 29 as well? I'm probably opening a whole new can of worms here..."
(( Robbie, i like your photo )). all these grimacing heads together popped a question into my head. As I admittedly am not as familiar with the comic details as I could be (and I am sure others here are), did you guys ever address the presence of...teeth? I mean, in the old toon continuity it would make sense that the turtles could have teeth because the mutagen combines two creatures. BUt in the comics the mutagen simply makes things large and more intelligent correct? So why turtle teeth? Artistic license? I mean, I like 'em with teeth, just curious if that was ever addressed. all these grimacing heads together popped a question into my head. As I admittedly am not as familiar with the comic details as I could be (and I am sure others here are), did you guys ever address the presence of...teeth? I mean, in the old toon continuity it would make sense that the turtles could have teeth because the mutagen combines two creatures. BUt in the comics the mutagen simply makes things large and more intelligent correct? So why turtle teeth? Artistic license? I mean, I like 'em with teeth, just curious if that was ever addressed." This is awesome news. #29 with your sketch in it, it's great to see the others are willing to chip in. I'd love one by Dan Berger myself. The order isn't up yet but when it is I'll be sure to get myself one. I want one too. I even want a Jim Lawson one. "I think that back in 2003, when we created these characters..."
Wait, what? 2003? TIME PARADOX! Wait, what? 2003? TIME PARADOX!" Any reason why the turtles can't have fingernails? Any reason why the turtles can't have fingernails?" You know, it's funny -- when Kevin and I were working out the final design of the Turtles before doing the first issue, we had actually considered giving them sharp claws, much like those possessed by real turtles. But it looked weird, so we went with the more cartoony (and admittedly easier to draw) blunt fingertips. That's what we have Michael Zulli for. For all of those TMNT fans who need anatomically correct mutant turtles, refer to Soul's Winter! You know, I really think it is neat when people do "realistic" intereptations of the turtles, like hereActually, now I'm curious...What do you think about these kinds of presentations of the turtles Pete? You know, I really think it is neat when people do "realistic" intereptations of the turtles, like here Actually, now I'm curious...What do you think about these kinds of presentations of the turtles Pete?" Any chance I could order a copy and kick in a few extra bucks for one by each of you? Otherwise, I'd have to say surprise me...And take whichever I get..*smiles* The is no way to lose in this situation. But man, I'd realy like one of each!! "That being said, probably my favorite "realistic" rendering of the Turtles -- if you can call it that -- was how the Henson Studio did the Turtles in the first live-action movie. -- PL"
I absolutely agree...The look and emotion that was able to be captured in the characters in the first movie is outstanding. I believe the whole appearance and feel of the film as a whole was the absolute correct balance of what a tmnt film should be. That spirit, combined with todays technology makes me very eager to see what can be accomplished with the upcoming new film. Will you be doing a random full body sketch again in the batch of signed copies? 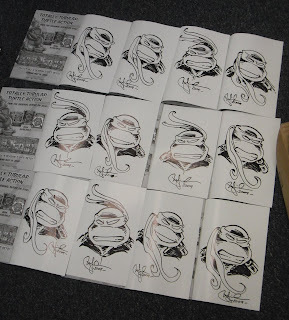 Will you be doing a random full body sketch again in the batch of signed copies?"